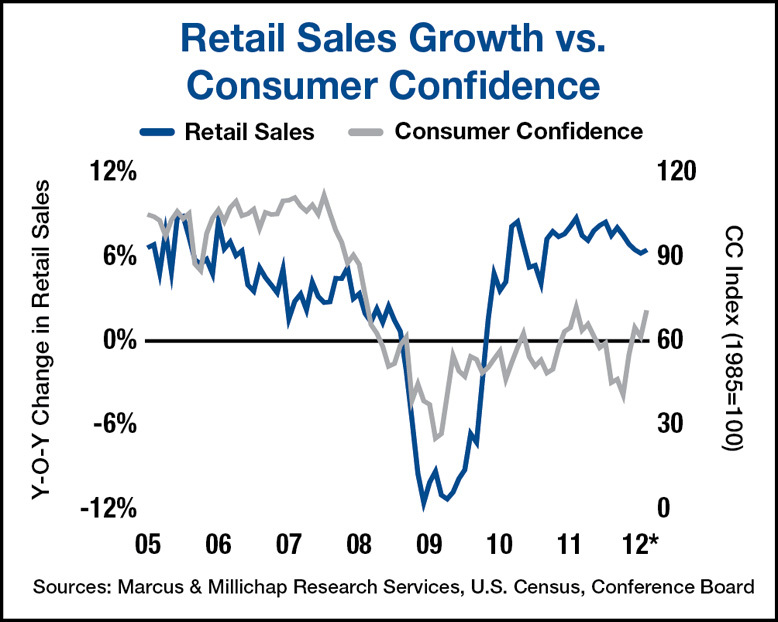 February retail sales posted stronger-than-expected gains, underscoring consumer confidence and resiliency. The pace of spending growth improved from January’s disappointing 0.6 percent, recording the strongest gain in five months and following solid fourth-quarter GDP growth of 3.0 percent. Job growth has surpassed 200,000 for three consecutive months while initial jobless claims for the first week of March ebbed to a four-year low, signaling positive momentum and moderate economic strength. Still, numerous headwinds could constrain trade, spending and the pace of economic growth, most notably mounting tensions in the Middle East creating a spike in oil prices, as well as the cyclical weakness in the European economy. Total retail sales increased 1.1 percent for the month of February and 6.5 percent on a year-over-year basis. Excluding motor vehicle and gasoline sales subtracts 100 basis points from growth to a still-strong 5.5 percent. February spending reflects greater dispersion than prior months, with broad-based gains not only in necessities, such as gasoline sales, which climbed 3.3 percent higher for the month, but also in discretionary items in the auto sales and apparel segments, which grew 1.9 percent and 1.8 percent, respectively. Department stores also turned in a surprisingly strong performance, posting a 1.5 percent increase for the month. Housing-related categories have performed well recently, with marked strength in building supply stores, which increased 1.4 percent, although receipts at furniture stores dropped by 1.2 percent following several consecutive months of strong gains. Nationally, asking and effective rents averaged for all retail types remained unchanged, stemming 12 consecutive monthly declines in effective rents. Forward projections call for a further decline in vacancy to 9.2 percent by year end. Strength in consumer spending, trade and the manufacturing sectors benefits industrial properties as rising capacity utilization rates and inventory rebuilding stimulate warehouse demand. The nearly 97 million square feet of industrial space absorbed in 2011 represents a 500 percent increase over 2010. Risks of a spike in oil prices and eurozone weakness heighten the prospect of weaker trade volumes, which would attenuate demand and slow expansion. However, vacancy could tighten by 90 basis points to 11.0 percent by year end if the economy continues to expand as forecast.percent this year and will decline to 5 percent in 2012 as minimal development and healthy demand persist. This entry was written by marcusmillichap, posted on March 19, 2012 at 6:12 pm, filed under Research. Bookmark the permalink. Follow any comments here with the RSS feed for this post. Trackbacks are closed, but you can post a comment.